Camp Kitchen Kit For Food On The Go! Camping and road trips are a heck of a lot of fun, despite lacking many of the creature comforts that come from a house and its amenities. 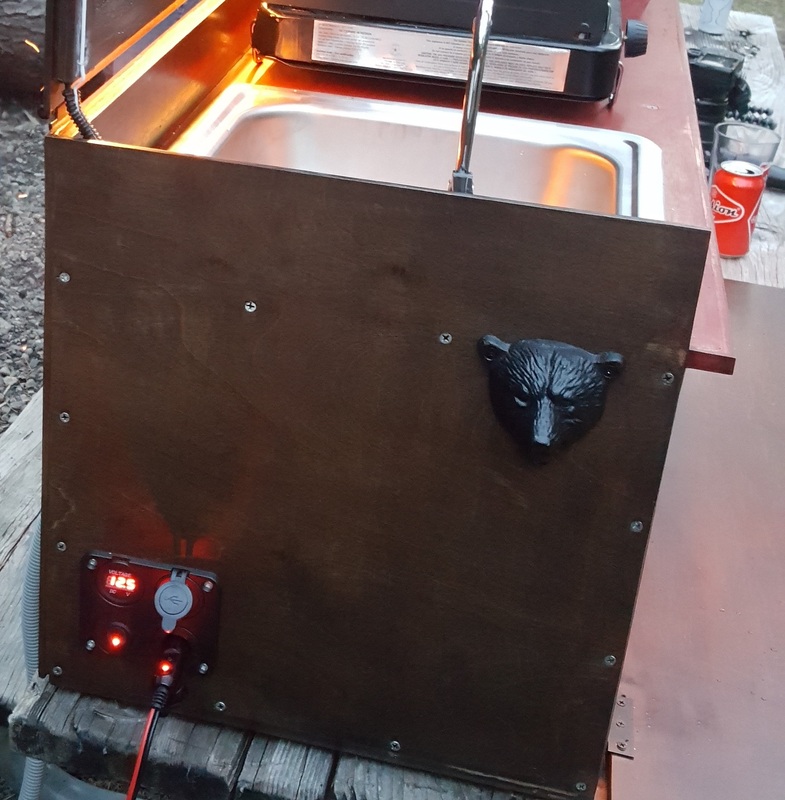 We’re all for fire-cooked meals, but sometimes, you want a cook-top and a sink to make cooking on the go a quick process. What if you could pack up a kitchen into a box and take it with you? [pointblankjustice] — opting for overkill — built this for his girlfriend instead of the requested box to simply store camping supplies. Glued and screwed plywood forms the frame, drawers, and lid which was then stained and painted to make for an appealing finish. A simple propane camp stove makes a worthy cook-top. Obviously, one must include a kitchen sink, so a small bar sink and hose faucet are kept running with a cheap, 12V, 35psi pressure pump from Amazon. A little doughnut magnet keeps the faucet secured when not in use. Spent grey-water drains from a hose into a bucket or into a ditch (don’t worry — [pointblankjustice] uses biodegradable soap!). As an added bonus, [pointblankjustice] has some under-cabinet lighting and accent lighting to keep things cooking late into the night, with power supplied by an extension cord going to their Jeep’s cigarette lighter outlet — plans to add a built-in battery are pending. There’s also a pair of USB ports to keep one’s phone charged and a bear-shaped bottle opener to keep the good times rolling! 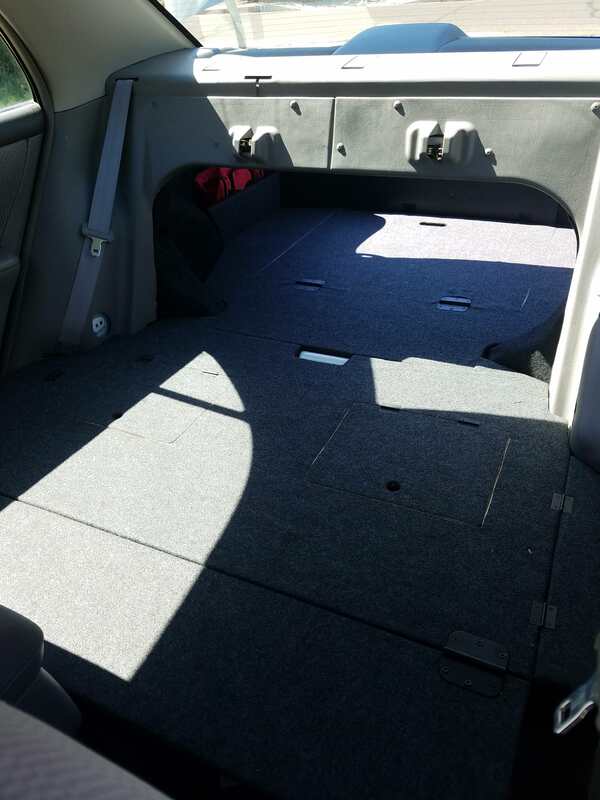 The kit packs up nicely and fits snug in the rear of [pointblankjustice]’s Jeep with enough room for other supplies and a pair of dogs. 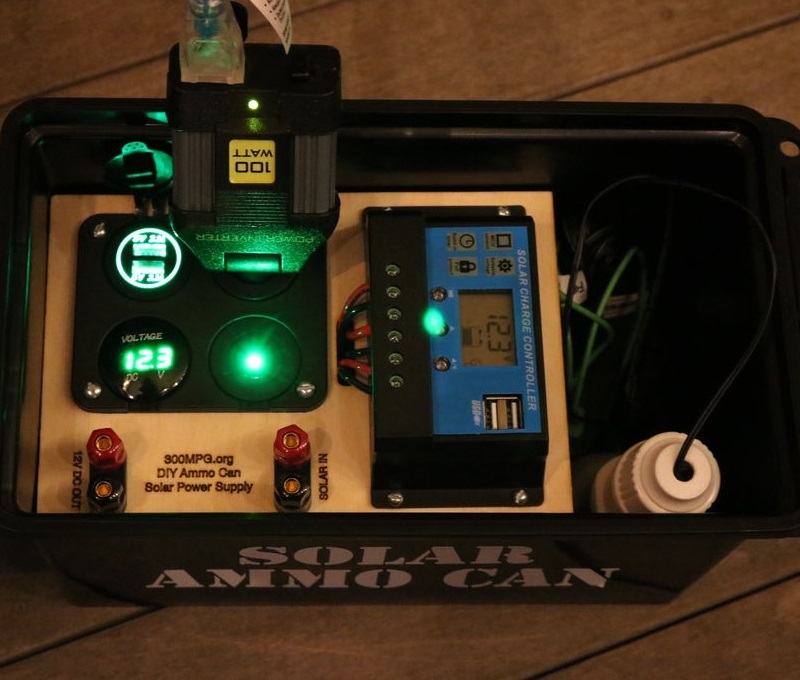 For longer hauls out into the wilderness, you might consider bringing a solar power supply unit that literally lasts for days. For many of our parents, grandparents, and great grandparents, the things we consider hacking, making, and doing weren’t just for fun. They were important skills that could help one survive. This week [Dino] shows us something his dad taught him: waterproof fire starters. The trick is paraffin wax. [Dino] starts by melting down some wax in a pot. He then dips strips of newspaper in the liquid wax. Several strike anywhere matches also get the wax treatment, are then placed on the newspaper. The newspaper and matches are rolled up into a tight bundle, which is itself dipped in wax several times. The resulting small bundle of waxed newspaper and matches is safe and easy to carry in pocket or backpack. It also becomes the perfect wet fire starter. The “newspaper shell” is torn off into strips of waxed paper, which burns slowly and allows the tinder and wood to catch. [Dino] demonstrates his pioneering skills by starting a fire at the end of the video. When the inevitable zombie apocalypse hits, we definitely want [Dino] at the Hackaday compound.